Showing banners/ads on your website is an important task and it should not be difficult. WPBanner got you covered in this matter. WPBanner provides three main methods for showing adverts. While creating advert you can select the option for where to show the advert. You can show the advert before every post’s content, after every post’s content, before every page’s content or after every page’s content. To give you more control over displaying adverts there is an option of “custom selection”. This option allows you to show adverts before or after specific posts and pages content. If you want not to display an ad for any reason simply choose option “Don’t show” and ad will no longer be visible on you site. 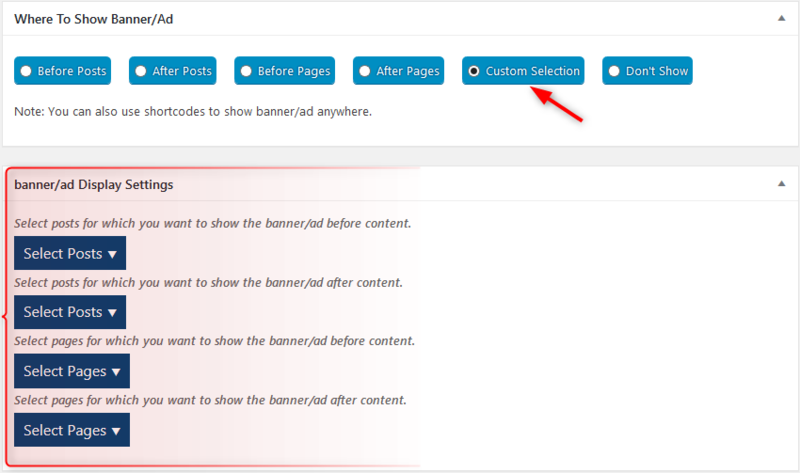 WPBanner provides you the option to use shortcodes for displaying adverts anywhere on your site easily. You can get shortcode for a banner in following ways. i) Go to the “Banners” menu in your Dashboard, click on “All Banners” and on right side you can see shortcode for every advert in front of its name. Just copy it and paste it anywhere you want on your site to show the advert. You can also get shortcode while creating/editing advert. You can see shortcode of the advert on right side. Copy and paste it to show advert anywhere you want on your site. If you directly want to paste shortcode in your theme’s file you can also do that. Use the following code in theme’s file where you want to show your advert. <?php echo do_shortcode(‘[showbanner id=”78″]’); ?>. Remember to replace the number (78) with the banner-id you want to show.